Medical researchers are far from finding a cure for incontinence, but they are making deep inroads into mitigating, and sometimes reversing, the ravages it inflicts on the body’s largest organ. Still, despite all the science around skin pH and the plethora of innovative products and treatments today, researchers continue to be puzzled why so many cases aren’t spotted earlier. admission received prevention measures. “Knowing the risk factors of IASD and their importance will support prevention efforts and hopefully raise the percentage of prevention that is given to residents with incontinence,” Bliss said during a recent McKnight’s webinar. Clinical practice also is stymied by bedside caregivers, too many of whom have dismissed incontinence as simply an unavoidable consequence of aging. Such attitudes, some researchers say, lead to costly delays and sometimes overlooked interventions that could have prevented skin damage and wounds. “If you want a practice change to occur, it has to happen at the level of the professional or person who is at the bedside. They have to be knowledgeable and have skill to be able to translate that,” says Liz Jensen, RN, MSN, RN-BC, clinical director for Direct Supply Inc. Jensen, who is certified in gerontological nursing and a long-time educator, pointed to a recent study by University of Southern Indiana researchers published in Urologic Nursing. Its prevalence is unquestionable. Incontinence affects more than half of the elderly in senior living settings, according to the National Association for Continence. Michelle Christiansen, vice president of clinical sales and marketing for Medline, believes that figure is much higher. “Nearly 80 percent of nursing home residents suffer from urinary and bowel incontinence,” she says, pointing to a recent Centers for Disease Control and Prevention study asserting that nearly 51% of people aged 65 and older living at home reported bladder and/or bowel incontinence. And it’s a stubborn malady that defies even the best of best practices. Bliss and her colleagues studied more than 980 nursing home residents to explore the underlying causes and risks for IASD, which in addition to leaked body waste include irritating cleansers and, ironically, some types of adult briefs. “Why is assessing for IASD so important? For many years, it was an unrecognized and overlooked problem,” Bliss says. Studies have shown that even for nursing home residents on a skin damage prevention program, the prevalence and incidence of IASD never hits zero, Bliss adds. In fact, its recurrence rate can be as high as 6%. In one study that monitored nursing home residents over a 40-day period, IASD continued to recur in several residents — even after initial treatments. Complicating matters is the fact that so many nursing home residents with chronic health issues could have underlying systemic problems that compromise the health of their skin, and those with cognitive deficits suffer from toileting challenges, Bliss says. Several years ago, Direct Supply piloted a new bladder ultrasound scanner with customers in two nursing homes to gain feedback and provide training. Jensen says that led to an epiphany. While educating caregivers continues to be an uphill battle, the industry has answered the call for better treatments and preventive measures. Many times over. Tripi attributes a shift toward universal protocols to “higher-performing nighttime products that allow the resident to sleep through the night without compromising care. Additionally, instead of a one-size-fits-all approach to product selection, there is a greater practice of individualized care based on a resident’s acuity level,” he says. He also notes the recent innovations around a proprietary, spiral-shaped, plant-based cellulose material called “curly fibers” that significantly lowers skin pH, staving off IASD in many nursing home residents. Innovations haven’t been limited to products. “Over the past ten years, caregivers are more aware of the importance of monitoring the nutritional status of patients in senior care facilities,” says Lisa Logan R.D., CNSC, enteral program manager/nutrition support clinician for McKesson Medical-Surgical’s Extended Care-Clinical Resource Team. It came from the industry’s long-awaited recognition of the prevalence of malnutrition in the nation’s elderly, she adds. No one in the long-term care environment disputes the fact that much remains to be learned as they unravel the complexities of this cruel condition that afflicts so many older people. Bliss and her colleagues have done pioneering work in IASD assessments, and their findings about methods and products to lower skin alkalinity are widely known. The field is rife with passionate and dedicated people whose work will continue to defy incontinence naysayers. McKesson’s Podlogar, for example, radiates hopefulness. “Being old does not mean you must become incontinent,” she says. Proof came during a series of collaborative efforts with the facilities of Ball Pavilion, part of Erie, PA-based Brevillier Village. 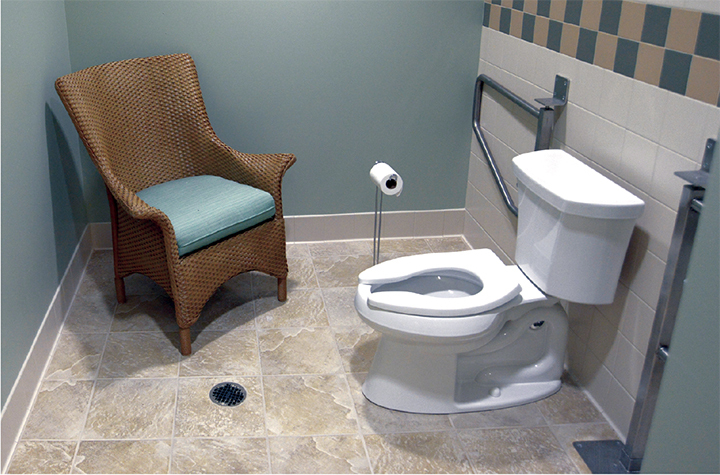 “Once we were able to convince them that they should apply the same [incontinence care] techniques to their assisted living as they did to long-term care — like assessment, product selection and choices — and really start to address it, they noticed a tremendous increase in residents’ participation in activities, social outings and the time people spent with their families,” she notes.